Got to https://github.com/arqma/arqma/releases and download what you need (Windows users can download the 64bits compiled binaries). Extract files from zip and put them in a folder (In this example we will use "C:\Users\Nobody\arqma"). Start cmd.exe and navigate to your folder. Then start your deamon with "arqmad.exe" and let it sync. It will take a while. te_protocol_handler.inl:1172 ←[1;33m[70.231.32.24:34028 INC] Synced 501/9737"
The important part is "Synced 501/9737". We have to wait until the daemon is synced with the network. Once done you will see the message "SYNCHRONIZED OK". 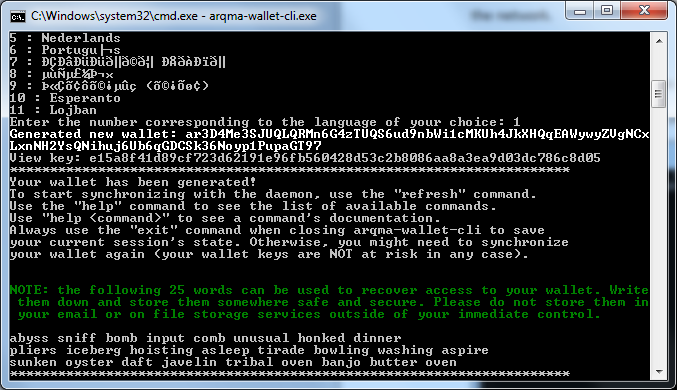 Then start the wallet with "arqma-wallet-cli.exe"
Go to "C:\ProgramData\arqma" delete all files within folders. where:"priority" is how fast you want to send arqma coin. Valid values in priority order (from lowest to highest) are: unimportant, normal, elevated, priority. The higher the priority, the higher the transaction fee. "ringsize" is the number of inputs to include for untraceability. Typically, 7 is normal. Highest level is 41 and will create more transactions which might increase the fee. "address" is the wallet address you wish to send coins to. "payment_id" A payment id provided by the recipient. Such as for exchanges that like to receive with that id. 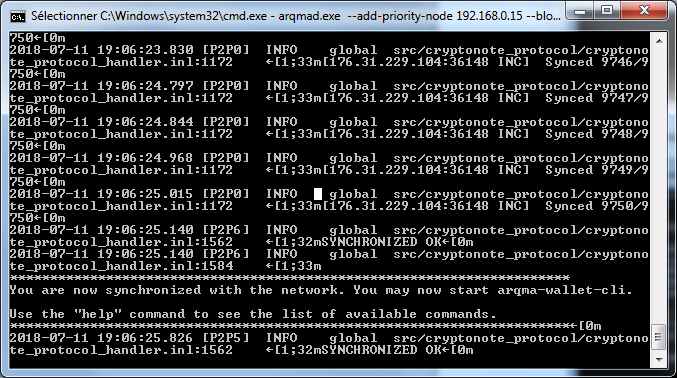 Or, you can generate your own with the payment_id command.example: "transfer normal 7 wallet address amount"